Upgrade your dog’s playtime potential with the Frisco Rope with Double Handle Grips Dog Toy. Designed for playing games and fetch, it features two soft, textured rubber fetch sticks that are easy to grab and hold, and a rope for added excitement. With no squeakers, you can turn up the fun without any noise! The combination of the polyester rope and thermoplastic rubber sticks creates a tempting toy that’s suitable for plenty of daily supervised play. Toss it and let the games begin—it’s a great way to help keep your dog active, healthy and entertained. Two play styles in one—games with the knotted rope, and fetch with the soft, textured rubber sticks. Squeaker-less design lets you have all the fun with none of the noise. Toss it farther—swing the rope to sling the toy even further for really energetic dogs. Made of polyester and thermoplastic rubber for the variety of textures dogs love. Does this toy have any squeakers? This toy doesn’t not have a squeaker. This is recommended for spot cleaning. This toy is made out of rope, with the handle made from thermoplastic rubber. Boredom has met its match—these toys are ready for your pup's favorite game! Choose rope toys with fun knots or built-in loops and rubber handles that are easy to grip. Plus, there are also footballs and dumbbells to up your playtime potential. These rope toys are designed for maximum fun with features your pup will love. Bring on the games with built-in tennis balls, rubber sticks, neat knots, and even handles! They're the perfect way to bond with your dog, and keep him active and healthy. Playing with your dog helps him get his daily exercise in. That's why Frisco has toys with features that are the right kind of fun to keep dogs engaged in play. 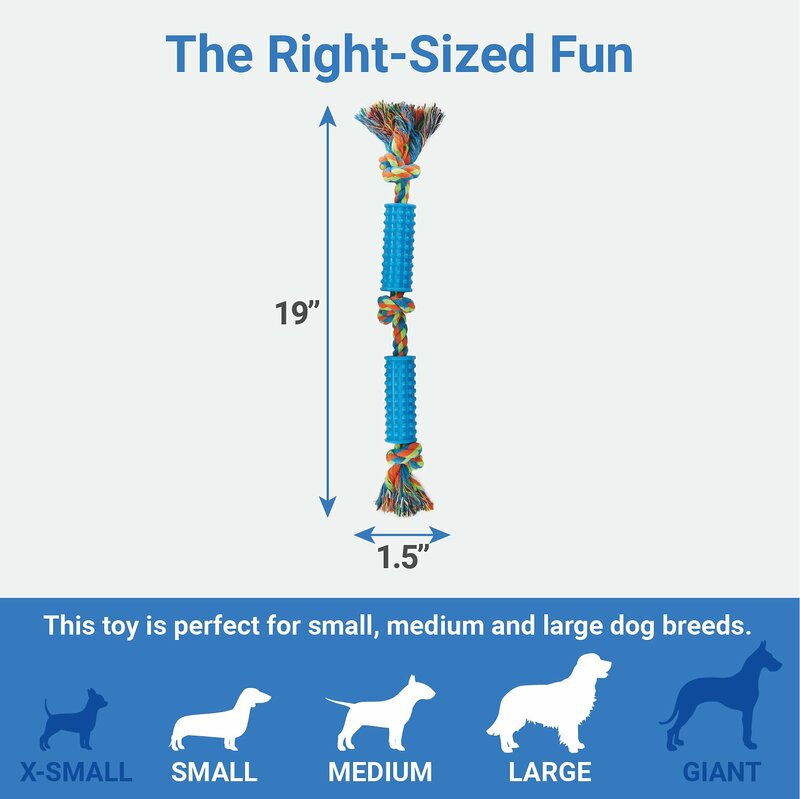 And so all pups can get in on the games, you are sure to find a toy that's the right size—and shape—for your pooch. I have a 25 pound terrier mix that can destroy a toy in mere seconds. This one has lasted about a month. She has chewed all the ends of the blue plastic, and the rope, but it has remained intact overall. I will definately purchase it again once she finally ends up destroying it. A good buy. The toy said it was also good for large breed dogs but it I waaaay too small for my dog so I gave it to my sister's dog who promptly destroyed it, the rubber on the rope is not that durable. Fun while it lasted I guess. I gave this to my two pups for Christmas, and it lasted for a month before showing any signs of breaking down. One end came undone, so I removed the grip from that side and trimmed and retied it. My pups like to use ropes for tug and chew sessions, hence the wearing down. Overall, a good investment. I thought this would be a great tug toy for our Saint Bernard however it is much smaller than I expected. I was looking for a much longer tug toy, however it does seem to be strong enough for her to tug with us. Not a you for chewer dogs! My boys started shedding this right away. It is given to them in moderation now. First, My lab mix (60 lbs or so) loves this toy! I bought it because his favorite game is tug, and I thought that maybe the plastic/rubber bits would last a little more than just rope and he could chew on them. He is a chewer. The rubber bits lasted maybe 3 minutes before he started tearing pieces off. I do appreciate that if pieces come off, the edges aren't sharp so he can still play with it under supervision (he just tears things, doesn't eat them). Its a good toy, but don't expect this to last as long as you hope if you have a chewer! My dogs have really enjoyed playing tug of war and surprisingly it is not apart yet! Do you have a chewwer in your house? This is the best rope with rubber teeth cleaning I've every purchased. Rocky gets so aggravated cause he cant figure out how to tear, ripe, and destroy this toy. I love it. Best money I've spent to far.